When I was young, one of my dad’s less salty insults to other drivers was, “Where’d you get your license? A Cracker Jack box?” I supposed it was an insult when comparing someone’s driver’s license to a plastic toy or fake tattoo in a box of candy, so I figured the term crackerjack was something insulting. But recently, I read this article from The Grammarist and had a surprise. Crackerjack is an American word that has been adopted the world over. Crackerjack means having a quality of excellence. 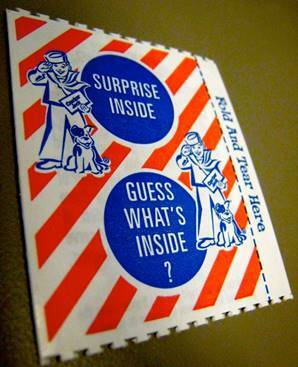 Crackerjack may be used as an adjective or a noun. It is a closed compound word, which is a word composed of two words that are joined without a space or hyphen between them. The word crackerjack has its roots in the world of American horse racing in the 1880s. At that time, it was usually rendered as two words as in cracker jack to mean a top quality horse. The term migrated to other sports, and eventually, mainstream English. Today, the term is usually written as two words when referring to the American snack of candied popcorn and peanuts that comes in a box. Traditionally, Cracker Jack included a small toy trinket in each box, but the company recently replaced the toy trinket with a QR code. [KC – What a swindle! I’d rather have a fake tattoo!] Note that the term crackerjack was in use before the snack was invented in 1893.
also crackerjack, "something excellent," 1893, U.S. colloquialism, apparently a fanciful construction, earliest use in reference to racing horses. The caramel-coated popcorn-and-peanuts confection was said to have been introduced at the World’s Columbian Exposition (1893). Supposedly a salesman gave it the name when he tasted some and said, "That’s a cracker-jack," using the then-popular expression. The name was trademarked 1896. The "Prize in Every Box" was introduced 1912. "Your brother Bob is traveling, isn’t he?"